This was the original page I created to advertise the Nice tour with information direct from Dave Kilminster. As the details here are now old news I suggest you check this page for more up to date information as well as reading the rest of this page. 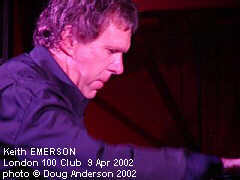 Since the Keith Emerson promotional show at the 100 Club (review + pictures here) in April where Lee Jackson and Brian Davison joined Keith (all three pictured to the left after the show) for three numbers rumours have abounded that a Nice tour would follow. 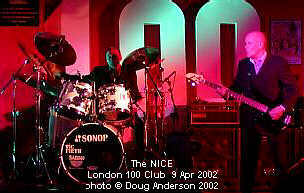 Those rumours now have a solid foundation as a short UK tour has been arranged for The Nice in early October. 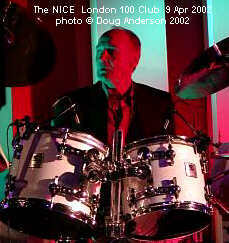 Tickets for the London date went on sale at the start of August 2002 with the remaining three dates following from the 12 August 2002. The show is due to take in more than just The Nice however. The set will start with Keith, Brian and Lee (the original guys from the Nice) who will be joined by guitarist Dave Kilminster (of Qango, John Wetton Band and Ken Hensley Band). After they play a set based around classic Nice favourites there will be an acoustic section where Keith and Dave play material from the recent 'Emerson Plays Emerson' album. Following this Pete Riley (drums - Ken Hensley with Dave K plus many others) and Phil Williams (bass - Rick Wakeman, Paul Young, Walk On Fire) come out for the final third to rock out with some ELP classics. Dave Kilminster came to the attention of Keith Emerson when he turned up a a Qango show in London and blagged his way onstage to join John Young on keyboards for the first encore track Fanfare For the Common Man. 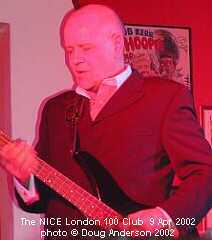 I now have a page abouth Phil Williams and a link to Pete Riley's site.. The book is available to order from Amazon for £11.19(20 Aug 2002, info - Andy W. Wilson). This page is Copyright © Doug Anderson 2000 - 2002. Created: 15 August, 2002. Last updated: 20 October, 2002.